Although the Year 2000 computer problem has to a large extent been solved, some unforeseen malfunctions will undoubtedly continue to occur, due to unforeseen eventualities or improper `fixes'. In the event that damage is caused as a result, who will be responsible for compensating the victims? May the software developers, vendors or licensors be held liable if their products fail to function correctly at some point after the change in the millennium? Do end-users have a duty to ensure that their software is Year 2000 compliant? These questions, among others, will not be answered fully until the courts have had an opportunity to rule upon disputes which will inevitably continue to arise. Other matters to be considered include the type of agreement that has been entered into between the parties, which rules will therefore apply, and what defenses, if any, may be available to the defendant. Insurance is also an important issue, especially as many insurance companies will not cover damage resulting from the millennium bug under existing policies, and defenses such as force majeure and act of God have been raised. 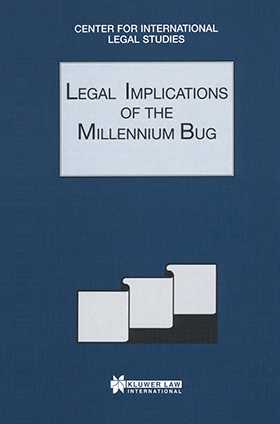 This special issue of the Comparative Law Yearbook of International Business discusses the legal implications of the millennium bug in various countries. It describes the way in which agreements relating to software are viewed by different jurisdictions, and the possible attribution of liability for damage caused by the bug.